Drill, intended to serve as warning against enemies that attacks will be met with ‘stern response’, involves army’s and Revolutionary Guard fighter jets including US-made F-4, French Mirage and Russian Sukhoi-22 planes. 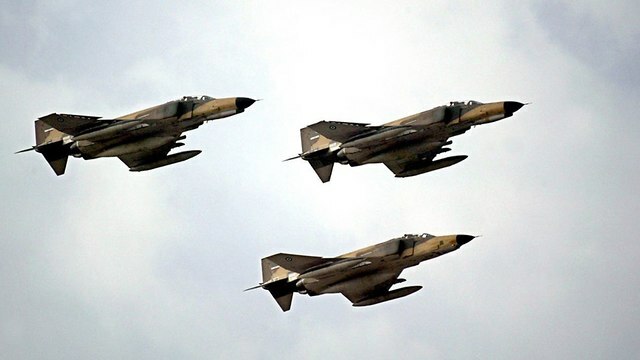 Iran’s air force is carrying out a drill near the strategic Strait of Hormuz in the Persian Gulf, the passageway for nearly a third of all oil traded by sea, the country’s official IRNA news agency said Friday. The drill involves the military’s and Revolutionary Guard fighter jets, including US-made F-4, French Mirage and Russian Sukhoi-22 planes, the report said, adding that five logistics and combat helicopters are also taking part in the exercise over the Persian Gulf waters and the Sea of Oman.IRNA said the maneuver is a warning to Iran’s enemies that they face a quick, “stern response” in case of any ill-will toward Iran. The exercise is part of annual manifestations on the anniversary of the start of the eight-year war Iraqi dictator Saddam Hussein launched against Iran in 1980. But it also comes after Tehran’s recent warnings that it would shut down the Strait of Hormuz if it’s blocked from exporting its crude because of US pressure and renewed sanctions on Iran. Tehran feels increasingly under pressure after President Donald Trump pulled America out of the landmark nuclear deal between Iran and world powers in May. In July, Iran’s Prsident Hassan Rouhani said that if renewed sanctions threatened Iran’s crude oil exports, the rest of the Mideast’s exports would be threatened as well. “In addition to a show of strength, this ceremony is a message of peace and friendship for friendly and neighboring countries,” Colonel Yousef Safipour, the deputy commander of the army for public relations said, according to the Islamic Republic News Agency (IRNA). This entry was posted on September 21, 2018 at 4:45 PM and is filed under Uncategorized. You can subscribe via RSS 2.0 feed to this post's comments. You can skip to the end and leave a response. Pinging is currently not allowed.